Promo buy a house directly Bed Room Set with prizes offered by PT Graha Total Insani (TGI) as the housing developer Cluster Pesona Boulevard Batam Centre, for 48 types who live a few more units. 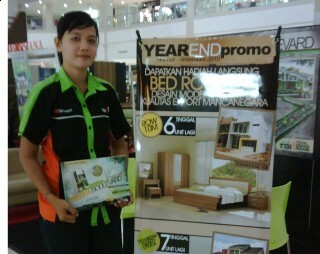 Renny Marketing Cluster Pesona Boulevard explain gifts Bed room set is a modern minimalist design, with foreign export quality. One Bed room set consists of bed 1.6 meters, 2-door cabinet and nightstand. "His unit was limited, only 7 units again. There is also the home ready stock," said Renny in his exhibition in the Kepri Mall, Tuesday (19/10). Developers are also currently being offered Town House type 108 with promo gift directly one Bed room set consisting of bed plus mattress spring bed 1.8 meters, Fridge 3 doors, dressing table and bedside table. What's interesting about this housing is, concepts and facilities provided by housing developers who embrace the concept of tropical gardens along 200 meters. The materials used are high quality material. To paint the walls, the developer using the Jotun brand that has been known for durable and lasting in any konsidisi. In addition to giving a gift that is quite interesting, Developer also provides an easy way more flexible. "In addition to mortgages with a down payment to pay installments of 12 times. It could also dengang hard cash and cash discounts of 10 percent gradually by 5 percent discount," He said.